So far, I’m loving my new home town. 🙂 I’m particularly excited to now be living in a real house, for the first time in nearly 8 months. It’s about 50 metres walk from this entry statement sign, a gentle cycle from work and I’m sharing with Chris, an Irish working holiday maker. It’s a little bit sad, but for me the happiest thing about it is the enormous built in wardrobe! 🙂 This part of the world really does have the “four seasons in a day” thing going on, and dealing with my cumbersome clothes storage arrangements and tiny wardrobe in Sweetie the Wonder Van has been frustrating. 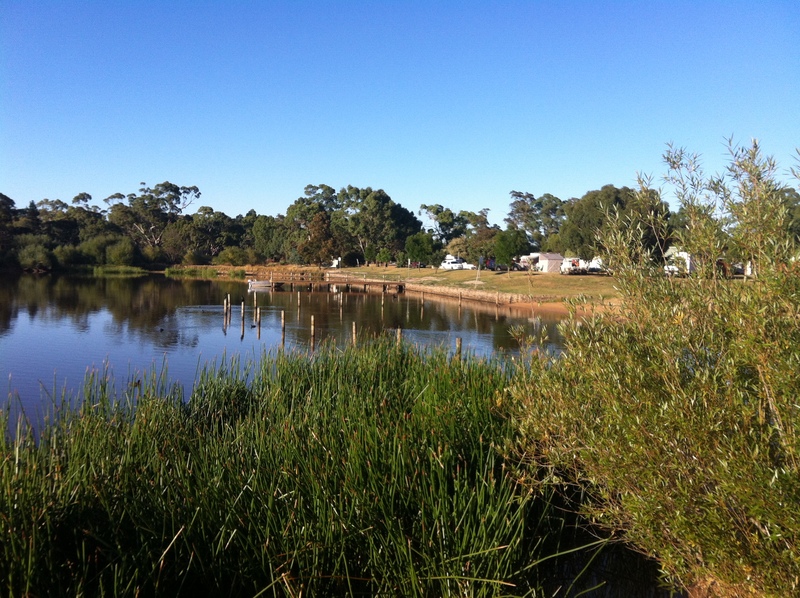 I do miss the lake a little though – living in the Beaufort Lake Caravan Park for the first two weeks, with the lake right there on my doorstep, was pretty special. It’s extraordinary to me how outgoing and confident I’ve become. Back home in Geraldton, I think I was just too comfortable – if I could avoid meeting new people I did; it was just so much easier to hang out with people I knew and didn’t have to try too hard with. While I’ve been travelling it’s been equally too easy to stay disconnected from my surrounds and to live a quiet solitary life. But now I’m settling into a new community, I am talking to business owners, shop assistants and casual acquaintances far more openly and freely than I have in a long time (or ever?). On the whole, I’ve found the locals very friendly and welcoming. I’m relishing making new friendships, trying to work out how the community functions and where I might fit into it. I feel more alive than I have in years. Amen to that. I’m also really enjoying my job – enjoying going to work! I obviously really did need a break, and it has done me wonders. I feel creative, inspired, capable, and full of confidence about my future. There are some great, thoughtful and very hard working folks that I’m fortunate to call my colleagues. It’s a great space to be. More on the community – last weekend I explored one of the local antiques / second hand stores and enjoyed browsing, identifying furniture and other bits and pieces that I hope to buy as my finances improve so I can make myself comfortable in my new home. 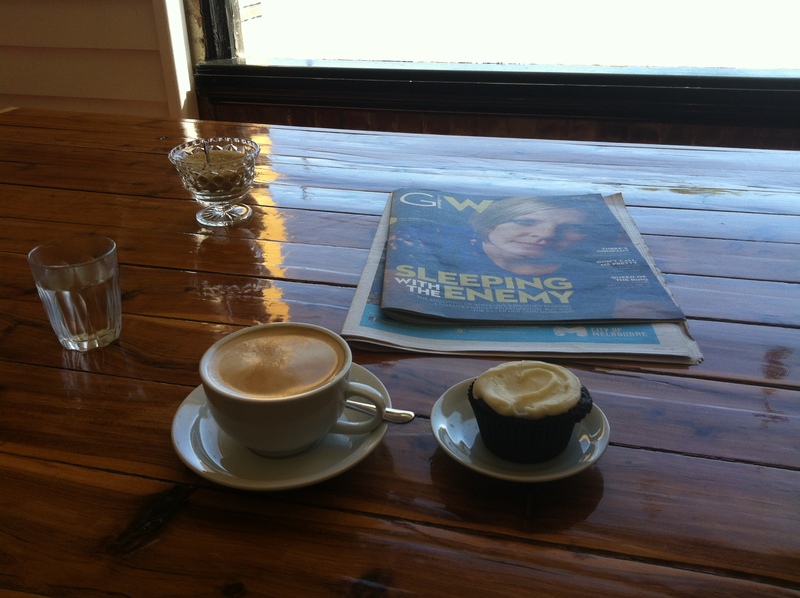 Then I decamped to Sparrows Café next door where I had a great coffee and extraordinary chocolate and Guinness cake – awesome! I suspect it will become a new favourite Saturday morning hang-out. 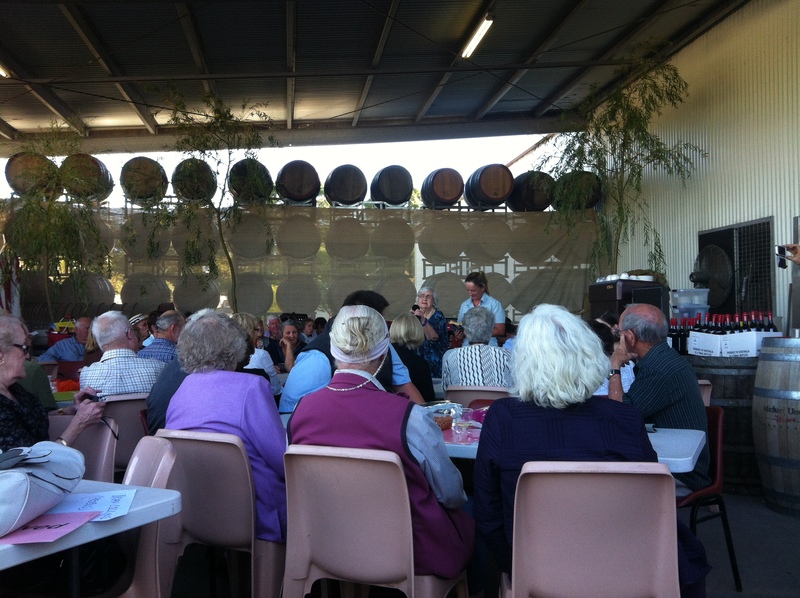 Last Saturday I went to the Twilight at Unwins event – a great fun annual event driven by the Pyrenees Arts Council, with assistance from the Beaufort Community House and the Shire and of course the generous hosting of Michael Unwins Wines. It was a night of bush poetry, storytelling and music (including the local brass band, who were the beneficiaries of funds raised on the night, and a talented guitarist) – and just a little wine. Or a lot of wine! Really enjoyable, and I met some great people. It inspired me to do more with my music, so that next time I might take part myself. I will certainly join the Arts Council. The last couple of days, the town has been especially buzzing. The Rainbow Serpent Festival is on for three days at a property near Lexton, about 15kms or so from Beaufort. Known by locals as “the hippy festival”, it attracts in the region of 12,000 people. Every shop I went into during my lunch break today was busy with shoppers stocking up for their three day camping, music, arts and lifestyle experience. The buses, camper vans, caravans and cars trundling past the pub where I had a couple of post work beers was a never ending stream. Great for local businesses and community groups who can do some invaluable fundraising! Not so great for my Shire colleagues in the planning, building and emergency services departments who’ve had no end of headaches trying to ensure the event was responsibly planned and met the necessary requirements of emergency service providers and building regulations. They got there in the end. 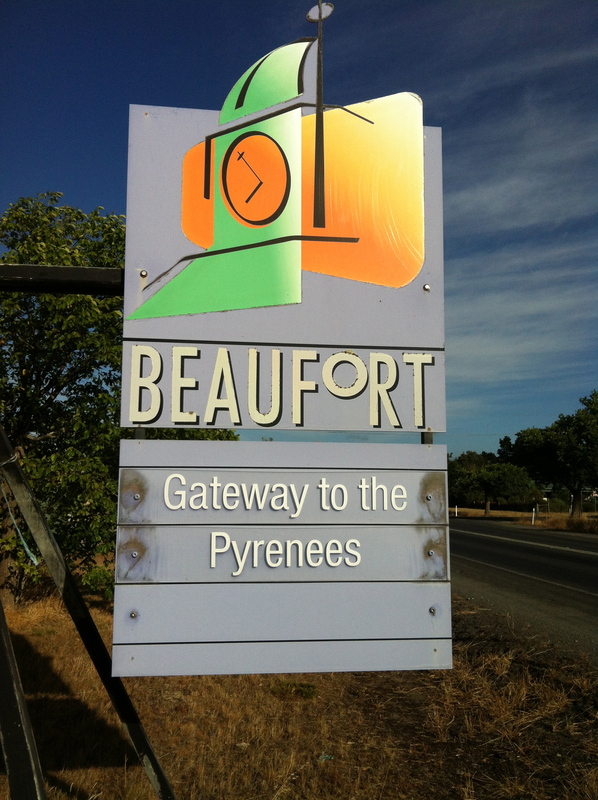 This entry was posted in Uncategorized and tagged Beaufort, Michael Unwin Wines, Pyrenees Arts Council, Rainbow Serpent Festival, Sparrows Cafe. Bookmark the permalink.